Gabe’s interest in cricket has grown this year: playing for club and school; going to the nets with friends; an obsession with kit; learning to score (and being paid to do so for the senior teams); helping me with some statistics; and now he’s been to his first match. We saw the fourth day of the third test at Old Trafford. He was very nervous about getting there. He changed seats a couple of times to get a clear view. He made a few enquiries about what I might buy for him, but otherwise was content to watch and exchange comments on the game. The Barmy Army set about their chanting in the afternoon, which bothered us both. But once that died down, other him having a nagging concern about getting on the tram home, we both could have sat there until the evening. The weather closed in, though, and we left in the rain shortly after tea. Gabe put down a marker, he would like to go back and go to Lord’s. L took Eliza and Robin to the Manchester Climbing Centre, which is sited in an old church. Both scaled 20m high walls, before pushing off and floating back to the ground. At home, Eliza scripted a play based around a female Harry Potter type character – Harriet. Robin played Dudley, with a football up his shirt and a midget Hagrid. When I saw the performance, Robin carried his script with him, Eliza memorised her words, directed the show and was chief stagehand. If L has a late meeting at work, Eliza and Robin go to after-school club. There’s no straightforward option for Gabe. There could be – he could wait at home, alone. He had a front door key, although that is now lost. But Gabe has a fear of being alone at home. In the past, he’s preferred to wait on the drive, in the dark and rain. He doesn’t wait patiently, but texts and calls L to find out where she is. She is where she told him she would be. Last week, he did let himself in, but took fright and ran outside again. L and I wait for something to click but, until it does, working late for L creates angst for mother and son. Eliza was the co-accused in a case of cyber-bullying. Closer inspection of the evidence showed an innocuous email, misconstrued by a headstrong schoolmate who had been ‘being mean’ to Eliza and her closest friend. Apologies have been said and we’ve had our first brush with the difficulties of children and digital communication. A long run of football birthday parties was broken by a climbing wall party. Robin revisited his heroics of many years ago and was one of only two of the boys at the party to climb to the top of the wall. Gabe has returned safely and excited from two nights away with school at an outdoor activity centre in Wales. He climbed, crossed obstacle courses, fenced, told ghost stories at night and didn’t wash at all. Stories bubble out of him on his first evening back at home. On the mornings I take Eliza and Robin to school, we all get distracted and have to leave home in a rush. I try to set a brisk pace to make sure we don’t arrive late. Last week Eliza hobbled with a sore foot from gymnastics and this week she was simply tired. “Daddy, you pull me like a suitcase,” she said, not annoyed, just commenting. Robin seems to have inherited my ability to fall asleep readily. He usually sleeps within minutes of being bade good night. Sometimes he’ll have his request for L or I to stay in bed with him for a little while acceded to. Tonight was typical. He took my hand and within 10 breaths was unconscious. Our first stop in London, down the road from Euston Station, was the British Library. Despite the kids being full of beans after two hours on the train, we directed them into the rare manuscripts gallery. ‘You have to make them do things like this,’ reasoned L.
Robin found a set of headphones beside a display of music manuscripts. ‘It’s not working’, he cried with his ears covered. ‘Stop shouting’ we hissed. ‘I’M NOT SHOUTING‘ he replied at a volume unsuited to the venue. A trip to London, taking in the Olympic Park for the Diving World Cup, was a source of anxiety for Gabe. A scene of past and potential future terrorism. He wanted not to travel by bus. At Euston we discussed the probability of a bomb on our bus. One in 1.2 billion we estimated – far less dangerous than crossing the road. The statistics swayed him, but he sat rigidly on the bus and wouldn’t go upstairs. We stayed with friends in London, whose daughter shares Eliza’s joy of climbing. On Hampstead Heath they clambered up and along the fallen trees. In the playground they swung back and forth across monkey bars, then set themselves tests of speed climbing up, over, down and swinging across the climbing frame. Grandma took us to a pick-your-own farm near Cupar. Wet weather had been followed by a day or two of hot sun. The fruit was at its peak. All three children were eager participants. Gabe wanted reassurance that each raspberry he picked met the standard. He wouldn’t eat a raspberry or strawberry – a mixture of a need for hygiene and a concern it wasn’t allowed as they hadn’t been paid for. Robin picked and ate. Eliza was persuaded to try a raspberry and found it favourable. Better than sweets she agreed. Back at home our plum tree’s crop was ready. Eliza and Robin, both drawn by the ladder, came with me to the end of the garden to pick. Each was to climb the ladder, pick three, then descend to allow the other a turn. So heavy was the crop that three had to be raised to ten if we were to complete the picking. Anyway, turn-taking on the ladder was made unnecessary by Robin’s scaling of the tree, which Eliza quickly emulated. As with Gabe and the raspberries, both children needed to be reassured that each of the plums they picked was ‘a good one’. Interest in picking didn’t evolve into interest in eating as both decided they didn’t like the taste of the plums they had picked. L took the kids on a half-term holiday treat to the local climbing wall. Robin, with pedigree in this activity, was the first to climb. Eliza was the first to scale the 12 metres. Gabe paced around nervously before his successful assault on the wall. By the end of their session, all three had reached the summit and all three had finished their final climb with legs juddering with exhaustion. The most anticipated and enjoyed culinary event of the week saw the three kids adding toppings of their choice to a Tesco’s pizza base. Gabe stuck with the margarita, and seeking something extra asked for herbs. The only fresh herb in the fridge was coriander, which I allowed him to use so as not to discourage his willingness to test something new. Robin also settled with the tomato sauce and mozzarella option. Eliza was more adventurous, adding sausage and sweet corn to her margarita. Successful trips this half-term included: a keenly contested cricket match on a basketball court, pirate games and obstacle courses on a fallen tree, roller blading to and around our local park. There were two notable bits of courage demonstrated by Robin at Gabe’s school barbeque. 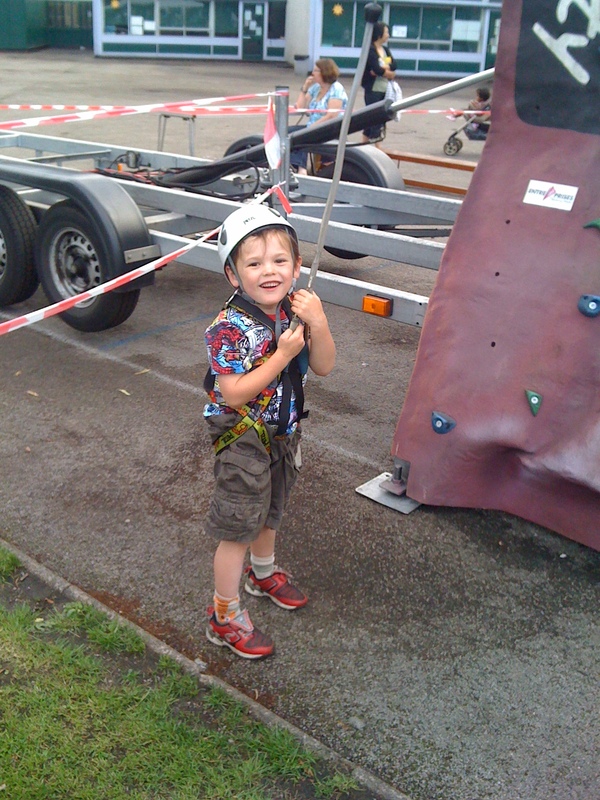 The publicly visible one was being the smallest child to attempt and indeed scale much of the climbing wall. For this he got encouragement and cheers from parents and kids. But to get to that position, Robin had walked up to one of the men operating the wall and, by himself, asked if he could go on it. Between me dropping Gabe off at school and L picking him up, G’s vocal chords stretched. Speaking a little huskily, he may have had his first joust with puberty. If so, the infant Gabe prevailed as his old voice returned the next day. Another rite of passage: his first cricket match played with a “corkie”. Batting for the first time in pads and helmet, Gabe attracted a lot of sympathy. The smallest pads were too large or too unfamiliar making him unable to run. Twice he was nearly lapped by his partner. The second time Gabe stood his ground leaving the other lad high and dry by the length of the junior pitch. Eliza designed an obstacle course in the garden and excelled, matching Gabe for the fastest time – down the slide, round the lawn mower, over the play car, dribbling the ball to the bucket and back to the beginning. As with any running event, Eliza’s fluency is disturbed by her need to pull up her leggings which slide down her skinny waist and hips.